After getting all those movies in the mail yesterday... I just couldn't shake the feeling that I wanted to dive in and start watching these movies. So I decided not to wait (the one day) to start my Weekend Movie Marathon. I figured I would jump right in. I am not considering this an extended weekend marathon... as I may want to end it early as well. Anyway... I am hoping to get several of the movies I recently got watched. I definitely need to work on them as my Unwatched Shelf is packed full once again. I been really excited about seeing this since I first heard it was being made. Maybe too excited as my expectations were pretty high.Though before watching it my expectations were lowered quite a bit when I learned there would be no Rube (Mandy Patinkin) in this movie... and that Laura Harris was replaced in the role of Daisy. I left this movie with mix feelings. It was so good to see most the old gang again. I am glad I decided to watch the series again before watching the movie. Even though the intro to the movie did explain what was going on... Watching the series before hand obviously gives you a much better feel for it going into the movie. First thing I see is they decide to go with comic book style intro to the movie as well as a few inserts within the movie. I am not sure why they decided to do this (is there a Dead Like Me comic?) but going directly from the series to the movie this really feels out of place. I really disliked the new boss in the movie. Even though I am sure you were supposed to. While Sarah Wynters did a fine job as Daisy — I felt that she was not nearly as good as Laura Harris. At the same time this movie did have the feel of the series. I really liked the whole George/Reggie storyline. This storyline was something that was begging to be told through-out the entire series. So I was glad to finally see it come. Mason was the same old Mason... which of course is a good thing. While Roxy did go out of character for part of this movie... it didn't last long. Over-all I would say if you are a fan of the series this is a must have movie to add to your Dead Like Me collection. Even though you can make sense of this movie without seeing the series first. If you haven't seen it I would recommend watching the series before you watch the movie. I really believe you would get more enjoyment out of the movie if you do. This is an enjoyable movie. It is a bit on the disturbing as well as on the disgusting side. But I think it updated the Vincent price classic well. I can't say that I prefer the original or the remake because even though the same basic story — the two movies are such a different style from the other that I enjoy each one pretty much the same amount for each of their particular styles. When I want the classic atmosphere of storytelling the Vincent Price version will more then satisfy. But this one is the one I want to see when I want a more disturbed... dark version of the story. Eric Stoltz delivers a terrifically well-metered performance as an ill-fated scientist's son who may share his father's fate. Martin Brundle (Stoltz) has experienced an accelerated growth rate since he first came into this world. But that's nothing compared to the change he undergoes when he falls for a beautiful researcher (Daphne Zuniga), and his hormones run amok...turning him into a walking nightmare! This is another one I only seen the one time before... when it first came out on VHS. It is a good continuation to the first one. But I don't think it was as good of a movie. John Getz returned as Stathis (the guy that got his hand and foot dissolved. It is a shame they didn't get Geena Davis to return for Martin's mother... even if it only would have been the one scene. The movie itself was done much like the first one. It starts off slow... more story oriented. But then comes to life with horror in the last half an hour. The last 30 minutes does contain a fair amount of gore as well. Over-all it was a good horror movie... but I have seen better. 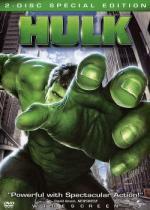 The larger-than-life Marvel Super Hero the HULK explodes onto the big screen! After a freak lab accident unleashes a genetically enhanced, impossibly strong creature, a terrifed world must marshal its forces to stop a being with abilities beyond imagination. The first time I watched this movie I was really disappointed. Before this movie the only way I knew the Hulk was from the '70s TV Series. That is all that I was used to. So I pretty much shunned this movie after seeing it the first time. Now that I have seen the great new movie The Incredible Hulk... I thought I should give this movie another chance on it's own merits. So when I was able to get it cheap I grabbed it for a second chance. After watching it for the second time I can say that I did enjoy it more then I did the first time. But I still think it was a poor attempt at a Hulk movie. The story seemed to go on forever... without much advancement to the plot. I hated all the split screens they used through-out the movie. I mean I know this is a comic book adaptation... I didn't need to be reminded of that by having so many split screens to look like a page of a comic book. That... to me... took away from the story itself. I will probably watch this one every great once in a while... but no where near as much as I will "The Incredible Hulk." When this was first released I tried to watch it... but ended up turning it off within the first 20 to 30 minutes of the movie. So this is the first time I made it all the way through the movie. I found this movie to be ok... but very little more then just an average movie. I found it to be a little long of a movie for the story it was telling... which made parts of the movie a bit slow... and dare I say boring for my taste. But it does have it's merits. It is a good base story... and some good scenes. To me it just felt like they were trying to make more of the movie then what they should have. He's cute, he's furry and he's completely invisible...except to Toby, his 8 year old best friend. His name is Lucky, The Magic Dog. When Toby's evil aunt Violet tries to steal Toby's inheritance, Lucky fights off 2 teenage bullies and wrecks Aunt Violet's nasty scheme. Only you and Toby can see his invisible friend when Lucky saves the say! I wanted to watch a movie with my daughter Brittany... so I told her to pick out one of her movies for us to watch. She picked this one... one I never seen before. I have to admit... this is a very cute and entertaining family movie. I enjoyed it more then I thought I would. This one actually had me laugh out loud more then once. Looking for a good movie to watch with your children... give this one a try. I think you will enjoy it. Meet Pete, our resident horror fanatic. So which does he prefer? Modern zombie classic, 28 Days Later, or My Magic Dog? I'm only teasing. I like 28 Days, but thought it could have been better. Being from the UK, there's added weirdness for me seeing London like that or the motorways (bear in mind you can't easily get permission to film in London anytime, so they did it after the clubs closed and before anyone went to work). But I'm put off with the reliance on digital. Looks odd. I prefer the sequel. Good to know you prefer the sequel... as it edges me to give it a chance. I was having a hard time on deciding if I wanted to or not. I reviewed it, so you should be able to find a link. Jimmy did too. He hated it, and obviously he's wrong , but our discussion (see his link) adds to review potential. I'm with Jon, the sequel is better. I just don't find Cillian Murphy very convincing, I'm including his turn as Dr Crane in Batman Begins.